The narrator's little sister has an appetite of unparalleled proportions, spanning the widest variety of...um...uh...well, not foods exactly, but a wide variety of stuff anyway. She eats one hare. She eats two snakes. She eats three ants (and their underpants). Students will soon catch on to these repeated lines and quickly join in. Their participation will grow in volume and excitement – she’s gotta lose it one of these times! – after each new meal. Maybe it’ll be the bats. Or the frogs. No? Then surely the lizards. C’mon lizards! The rhyme and rhythm of each page is flawless. Reading aloud books written in rhyming verse can sometimes be a gamble, but My Little Sister Ate One Hare is exactly as it should be. Readers don’t need to spend time deciphering rhymes, and there are no speed bumps in the rhythm. 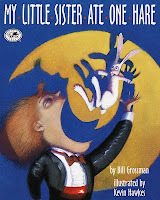 Read alouds of My Little Sister Ate One Hare can be fast and furious, matching the anticipation of whether or not the little sister will throw up as she eats more and more-er of the strange and stranger. That’s all I got, folks. I’m off to get a snack.